1) In a large heavy pot over medium-high heat, add wine, 1/2 cup of clam juice, clams, mussels and seasonings. Bring to a boil, stirring frequently. Cover and cook until the shellfish begin to open their shells. 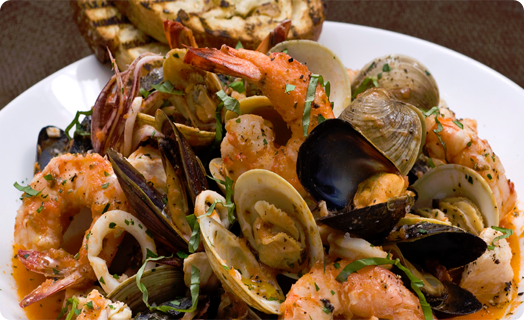 2) Add fish, shrimp, squid, Cioppino base and the remaining clam juice. Cover again and let simmer over low-medium heat for another 3-5 minutes. 3) Remove cover, check that all shellfish have opened, give a quick couple of stirs and transfer to bowls for service. 4) Add a pinch of fresh chopped basil leaves for color and garnish with a nice slice of toasted artisan bread for sopping-up the broth!